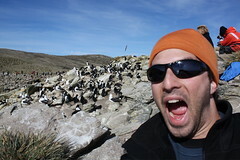 Thanks to Nature Valley Granola bars and the modern miracle that is youtube, I spend today 4-5 feet from Rockhopper Penguin and Albatross on New Island, the westernmost inhabited island of the Falklands, and the largest Rockhopper Penguin colony in the world. You cannot tell from my expression in this picture, but I was utterly awed and amazed by what I saw today. How could I not be. I spent hours sitting on the rocks, literally inches from these magnificent animals, in the middle of what is technically known, as nowhere. And let us say… Amen.